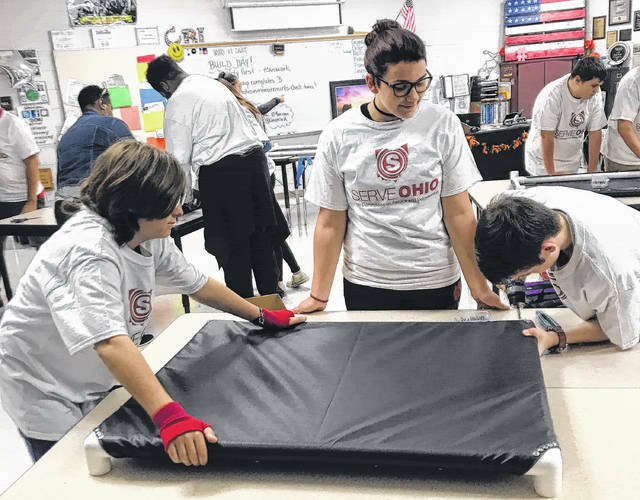 Students in the Delaware Area Career Center’s Career Based Intervention program at Dempsey Middle School assemble elevated dog beds for the Delaware County Humane Society on Friday after they recieved a $1,000 grant from SERVE Ohio. The students made 20 beds for the humane society so the animals would not have to sleep on concrete floors. The students worked on the project as part of Make a Difference Day Weekend and were divided into small teams to foster teamwork skills.